With little kids, carving pumpkins can be daunting so say the least. 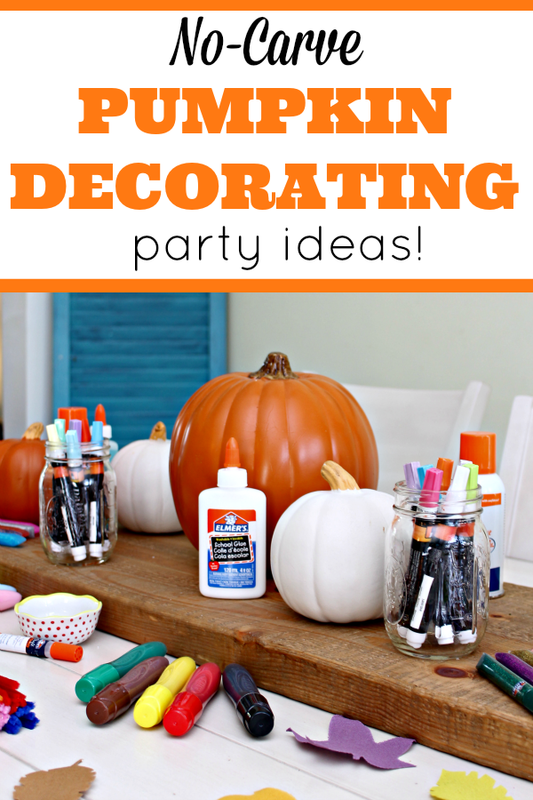 Here are some really easy and creative no carve pumpkin decorating ideas so you can throw your own pumpkin decorating party for Halloween or just for fun! Pumpkin decorating is so much fun! Kate and I both get so excited each year when fall comes around and love throwing a pumpkin decorating party. 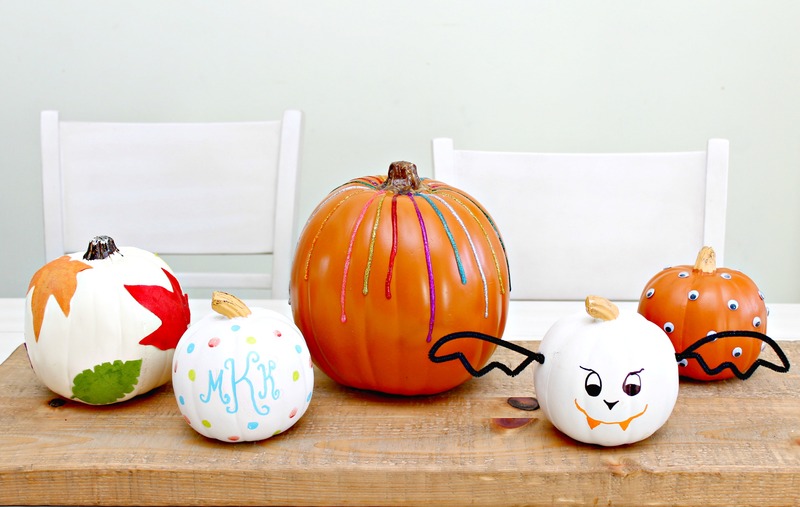 Sometimes it feels like pumpkin decorating usually means that mom or dad end up actually doing the decorating or cleaning and carving, so we really like decorate pumpkins a little differently…no carving necessary! 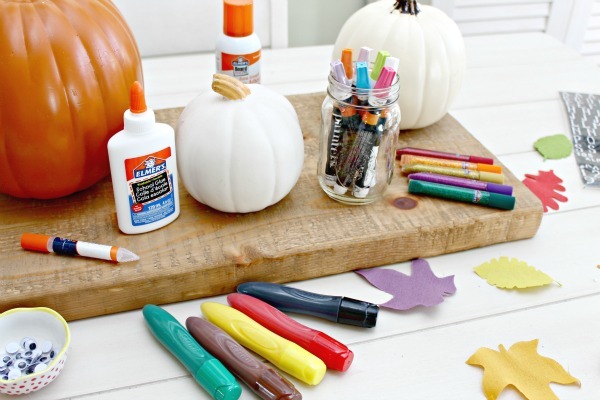 It’s a great way to actually let the kiddos use their creativity to decorate their pumpkins, and there are so many more things you can do! 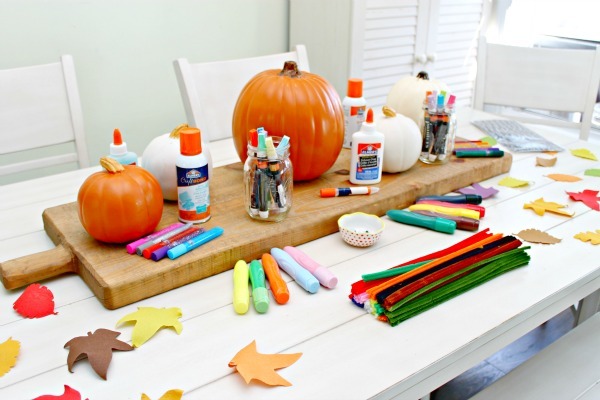 With a little help from our good friends at Elmer’s, we are going to throw the cutest pumpkin decorating party ever! Snacks. When throwing a party with kiddos, there must be snacks. This easy trick will keep your kiddos hydrated, without adding extra sugar. 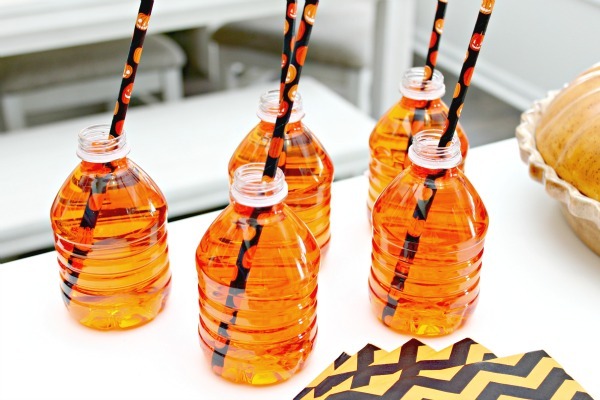 Simply add a drop of orange food color to a small water bottle and shake well. I like to remove the wrapper and add fun Halloween themed paper straws! I like to put out just a few snacks so they don’t distract from the decorating. 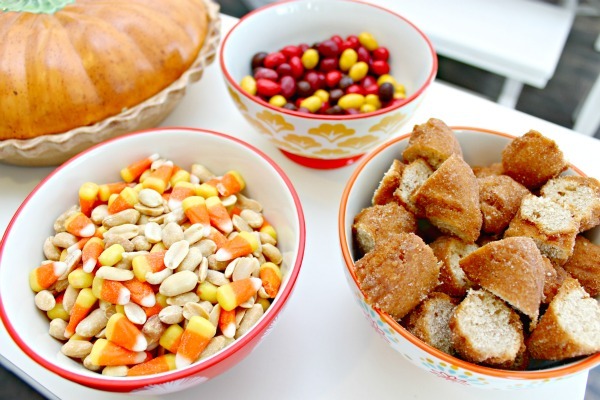 My favorite go to snacks for pumpkin decorating are Candy Corn Snack Mix, apple cider donuts cut into small pieces and some candy too! The easiest way I have found to get the kiddos involved is to set out all kinds of supplies and let them use their imaginations! 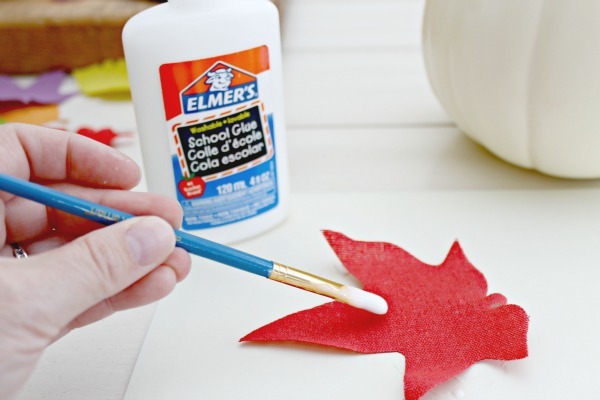 We LOVE Elmer’s Paint Markers, School Glue, spray glue, Glitter Glue Pens and Squeeze and Brush Markers. 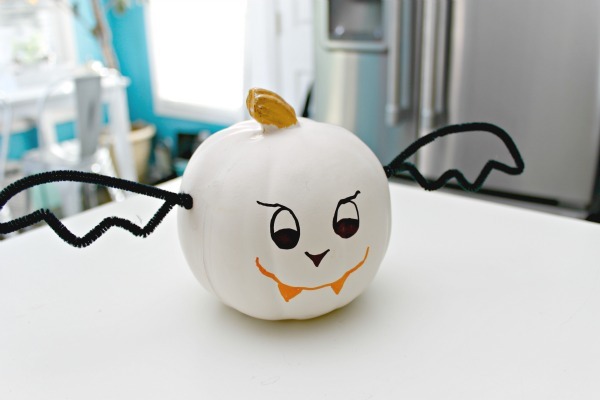 Let the kids grab a pumpkin and get creative! And remember…this is supposed to be fun! 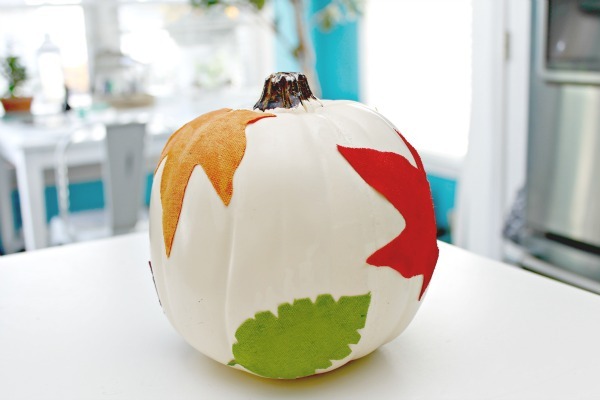 Elmer’s school glue can be used to decoupage items on the pumpkins like these cute canvas leaves! Simply brush glue all over the back, then once the piece is placed on the pumpkin, paint a coat of glue over the top as well. It will dry clear! 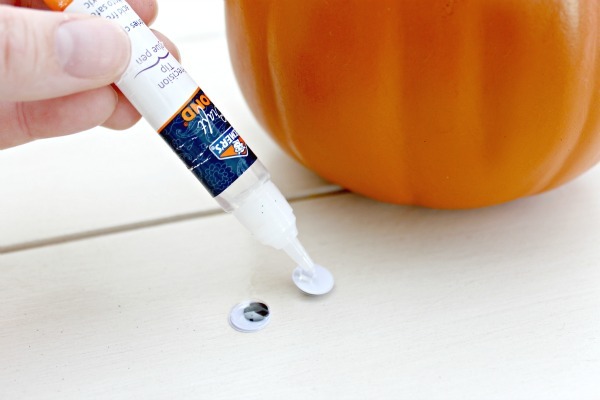 Use a Precision Tip Glue Pen to add small things like googly eyes with ease! 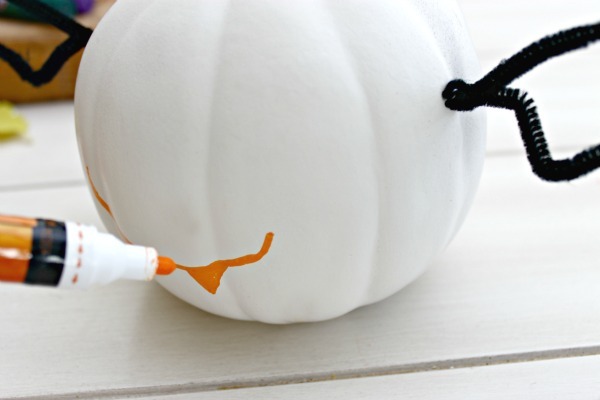 Paint markers can be used to add fun details like this mouth on our bat pumpkin or to draw words or polka dots! I love the way this decoupaged leaf pumpkin turned out! But this little bat pumpkin is my absoluet favorite! They all turned out super cute…this year, we have a Leaf Pumpkin, Kate’s Monogrammed Polka Dot Pumpkin, a Rainbow Pumpkin, that cute little Bat Pumpkin and a Googly Eyed Pumpkin! So, get with it…grab your supplies and let the creative ideas flow! Be sure to sign up for Elmer’s Parents Club Newsletters to receive a free ebook with tons of creative ideas and all kinds of creative and fun ideas for the whole family! These are such neat ideas and so cute, too! Fun projects for the kiddos and great keepsakes … or fabulous gifts to give to grandparents. :) Thanks for sharing! They do, and they work great on so many other things as well…even fabric!